Argentina And Venezuela Are Both In Economic Trouble. Which Will Survive? Executives at the Ford Motor Co. (NYSE:F) are worried about South America. Thanks to the unstable economies of Venezuela and Argentina, the company revised its sales predictions down for the region recently after making more positive forecasts just a few months ago. “Since December, we’re more concerned,” he told reporters on Tuesday, according to Reuters. “I think that it is an area that we will continue to watch very closely,” he added. As both governments try to control their runaway inflation rates and overvalued currencies, a black market for American dollars has emerged. People can sell their dollars for twice the official rate, and use the proceeds to buy cars. But the growth is not sustainable, and Ford is willing to see a slight drop in sales in exchange for a healthy economy in these countries -- but they’re more focused on one than the other. Experts say that despite similar dire situations, Argentina is more likely to recover than Venezuela. Though both countries have experienced capital flight, depleting reserves and explosive inflation, Argentine politicians have shown that they’re willing to adapt to the situation, while the Venezuelan government has staunchly refused to budge. “With both regimes imposing capital controls and managing their exchange rates, the respective economies have suffered from dollar droughts, creating shortages of many goods and feeding back into higher inflation,” wrote David Rees, an emerging markets economist at Capital Economics in a note. But “the Argentine government has shown more willingness to alter its policy mix in order to stave off a crisis,” he added. Indeed, both countries have had similarly bad years. Argentina has been losing about $1 billion every month from its reserves, and its international reserves dipped to $29 billion last week – down $13 billion from the year earlier. Its inflation jumped to more than 25 percent this year, according to private estimates, and continues to climb. Meanwhile, Venezuelan reserves dipped to $20 billion, despite the fact that the country earns more than $100 billion from oil exports. Its inflation has been in the double digits since the 1990s, and is currently more than 56 percent -- the highest in the Western Hemisphere -- thanks to severe currency controls that slow exports and create shortages. Argentina has had a notoriously bad inflation rate for the better half of the past decade. When the government defaulted on some $100 billion in bonds in 2002, inflation ran rampant, never fully recovering. The country’s current president, Cristina Fernandez de Kirchner, has nationalized pensions, an airline and an oil company while spending a great deal of government money on subsidies. This has drawn heavily on government funds. When combined with Argentina’s current account deficit (meaning it imports more than it exports), it added to spending problems. Other policies such as high export taxes also bogged down the economy. “Growth in government tax revenues has fallen behind that of primary expenditures, particularly as the authorities have continued to pursue an aggressive program of subsidies, worth an estimated 4.5 percent of GDP in 2013,” wrote Rafael De La Fuente, an economist at UBS, in a note. “The pursuit of monetary and fiscal policies that are inconsistent with price stability are essentially at the heart of Argentina’s growing balance of payments woes,” he added. 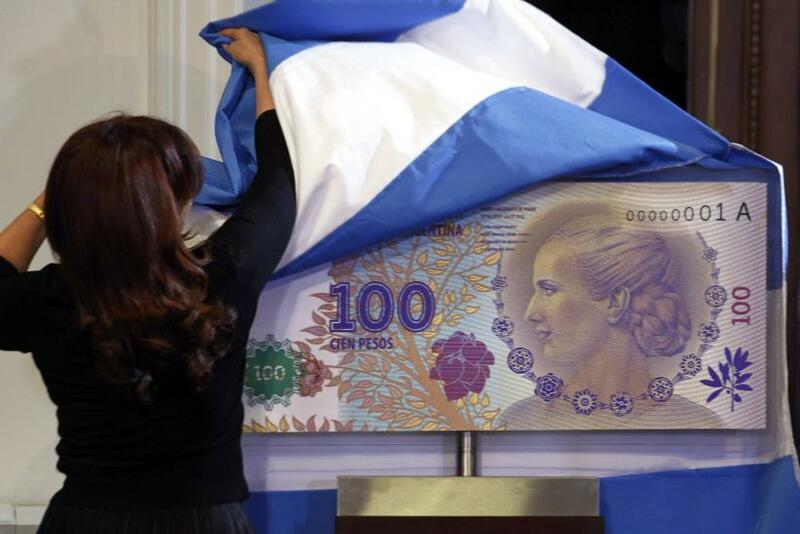 In response to the situation, the Argentine government allowed the peso to lose 15 percent of its value last week by removing prior currency restrictions. This week, the price stabilized at around eight pesos per dollar but the black market price is hovering around 12 pesos per dollar. Argentines have been using American dollars since a previous crisis in 2002. When the government defaulted on $100 billion in bonds, inflation spiked and U.S. currency became more reliable than the peso. On Monday, the government allowed citizens to officially purchase American dollars for the first time in years. They can now apply to trade pesos for a maximum of $2,000 USD every month. Plus, the tax rate on dollar purchases was lowered to 20 percent from 35 -- a fee that can be avoided if the money is left in banks for a year. By Monday 150,000 people had applied to make exchanges worth a total of $72.4 million, according to Jorge Capitanich, head of the president’s cabinet. But the government had only agreed to disburse $122,773 at the time, according to AFP. While the adjustments are far from perfect at least they're a sign of the government's willingness to adjust their policy. Prospects are looking much better for Argentines than for Venezuelans. “The comparison between Venezuela and Argentina is a valid one,” said Caracas-based economist Leonardo Vera to the Financial Times. Venezuela’s consumer prices jumped nearly 50 percent last year as the bolivar weakened. But President Nicolas Maduro’s attempts to pull the country out of its economic hole haven’t been substantial. “Mr. Maduro has been extremely dogmatic with regards to economic policymaking, dashing hopes that he would be more pragmatic than his predecessor, Hugo Chavez,” wrote Capital Economics’ David Rees. On Jan. 15 he announced that the current rate of 6.3 bolivars per U.S. dollar would remain throughout the year, and denied future devaluation. The official rate (6.3 bolivars per dollar) would continue to be used for necessities and essential goods such as food and medicine. Another floating rate (just over 11 bolivars per dollar) would be used for some types of investments, remittances and certain purchases like airline tickets. On Jan. 24 he announced a 30 percent cap on all corporate profits and added restrictions on purchases made abroad with credit cards and over the Internet. Most agree that these changes will do little to stave off inflation, and may in fact make things worse. Even outsiders, such as the Ford executives working in the country, are not impressed. Speaking from Venezuela, Ford’s chief financial officer offered a critique of these policies. “The government is trying to manage every aspect of the economy,” he said to Reuters. He explained that a lack of access to foreign currencies makes it difficult for Ford to pay for parts needed for production. “You know that just doesn’t work very effectively,” he said. Does Venezuela Need An Army General To Run Its Economy?